It has been a while between blogs - and with great reason. In May 2009, I moved to a little island, called Corfu, located on the north-western part of Greece. With mountainous views of Albania, Mediterranean weather and the island lifestyle, I have quickly slowed down my hectic London pace to just sit and get back to nature. (About time i'd say too). So this 6 months is a retreat back to nature and back to the inspiration that fuels my practice. I'm not sure what to expect from the collection that i hope to make by the end of it but as there is not much fungus here, the work will definitely be different. To understand why I have chosen Corfu - it is simple. 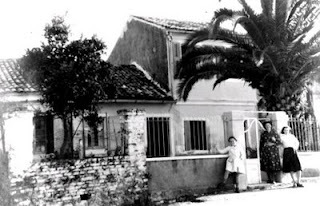 The picture attached is my beautiful grandmother's house dating back to the 1930's (ish) which i have finally located after a few weeks of roaming around blindly with this photo and greek letters which to a local may have made some sense. She is the one to whom i have changed my name so the connection is as special as one can be between a grandmother and a granddaughter.